Miniemulsion Polymerization Technology comprises 10 papers by many of the world's experts on the subject. 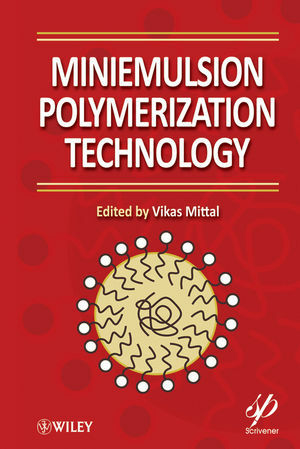 It summarizes the recent advances in miniemulsion polymerization technology including the advances on the selection of surfactants and co-surfactants, the expansion of miniemulsion technology in various polymers and co-polymer systems, and the use of miniemulsion polymerization for the synthesis of advanced polymer particle morphologies. There have been a large number of texts on emulsion and other forms of polymerization methods, but miniemulsion polymerization, though it provides unique routes for polymer particle synthesis, has been neglected. Vikas Mittal is a Polymer Engineer at BASF Polymer Research in Ludwigshafen, Germany. He obtained his Ph.D. in 2006 in Polymer and Materials Engineering from the Swiss Federal Institute of Technology in Zurich, Switzerland. He then worked as a materials scientist in the Active and Intelligent Coatings section of Sun Chemical in London, UK. His research interests include polymer nanocomposites, novel filler surface modifications, thermal stability enhancements, and polymer latexes with functionalized surfaces. He has authored more than 30 scientific publications, book chapters and patents. 1 Miniemulsion Polymerization: An Overview (V. Mittal). 1.1 Introduction to Polymerization Techniques. 1.2 Emulsion and Miniemulsion Polymerization. 1.3 Properties of Miniemulsion Polymerization. 2 Multi-Functional Stabilizers in Miniemulsion Polymerization (Alain Durand). 2.2 Stability of Initial Monomer Droplets. 2.3 Stabilizers and Polymerization Processes. 3 Structured Copolymer Particles by Miniemulsion Polymerization (V. Mittal). 3.5 Butyl Acrylate-(2-Methacryloxy)ethyl)trimethyl Ammonium Chloride. 3.6 Butyl Acrylate-Methyl Methacrylate-Vinyl Acetate. 3.7 Styrene-Acrylic Acid or 2-Aminoethyl Methacrylate Hydrochloride (AEMH). 4 Encapsulation of Inorganic Nanoparticles by Miniemulsion Polymerization (Jacqueline Forcada and Jose Ramos). 4.2 Miniemulsion Polymerization in the Presence of Inorganic Nanoparticles. 4.3 Encapsulation of Silica Nanoparticles. 4.4 Encapsulation of Magnetite Nanoparticles. 4.5 Conclusions and Future Perspectives. 5 Polymeric Nanocapsules by Interfacial Miniemulsion Polymerization (Guo-Rong Shan and Zhi-Hai Cao). 5.2 Organic Nanocapsules by Inter facial Miniemulsion Polymerization. 5.3 Organic-Inorganic Hybrid Nanocapsules by Interfacial Miniemulsion Polymerization. 6 Miniemulsion Polymerization of Vegetable Oil Macromonomers (Shelby F. Thames, James W. Razvlins, and Sharathkumar K. Mendon). 6.2 Emulsion Polymerization of Alkyds and Vegetable Oils. 6.3 (Meth)acrylated Vegetable Oil Derivatives. 6.5 The Potential for Emulsion Polymerization of Model Saturated Monomers. 6.7 Design of Thermosetting Latex Polymers. 6.8 Classifying Monomer Solubility for Macro and Miniemulsion Polymerization. 6.9 Soybean Acrylated Monomer Synthesis. 7 Controlled/Living Radical Polymerization in Aqueous Miniemulsion (Catherine Lefay, and Julien Nicolas). 7.2 Controlled/Living Radical Polymerization in Bulk/Solution: General Considerations. 7.5 Reversible Addition-Fragmentation Chain Transfer Miniemulsion Polymerization. 7.6 Iodine Transfer Polymerization in Miniemulsion. 8 Inverse Miniemulsion Polymerization of Unsaturated Monomers (Ignác Capek). 8.4 Traditional and Nonconventional Inverse Latexes. 8.5 Controlled Radical Miniemulsion Polymerization. 8.6 Amphiphilic and Associating Copolymers. 9 Double Miniemulsion Preparation for Hybrid Latexes (R.Y. Hong, G. Liu, B. Feng, and H.Z. Li). 9.2 Hybrids via Mini-Emulsion Polymerization. 10 Surfactant Effect in Miniemulsion Polymerization for Biodegradable Latexes (V. Soldi, B.G. Zanetti-Ramos, and E. Minatti). 10.2 Miniemulsion Polymerization of Biodegradable Latexes. 10.3 Mechanisms of Surfactant Protection of Colloidal Dispersions. 10.4 Effect of Surfactants on Miniemulsion Polymerization.